During an annual Kwanzaa party hosted by my siblings and me, guests gather around my grandfather’s TV as our second cousin, Ricky, tells us about his work trip to Zambia, where he met his second wife. It’s Dec. 2013 and I’m a senior in high school. This is not our first time hearing about Ricky’s new wife. At our uncle’s holiday party, Ricky announced that he was remarried, and there would be a ceremony the following June. A hopeless romantic, I’m excited to meet this woman who makes Ricky beam. As he regales us, Ricky calls her “Nama.” They met when Ricky was doing diplomatic work in Zambia. Nama was working at an embassy. One day, Ricky went out with colleagues and spotted her. He asked for her number and they struck up a friendship, which eventually morphed into a relationship. After two years of dating, they got married. Once Nama and Ricky realized they wanted to be married, Ricky courted Nama and paid her bride price, a sum the groom or his family gives to the bride’s family for marriage. This is customary in Zambia. What isn’t customary is to get married elsewhere and to not have Nama’s family present. Nama and Ricky were married on American soil. They made sure they upheld Zambian traditions when getting married. At the June ceremony, I got to see for myself how the traditions translated. While Nama floated down the aisle, she wore her hair in braids, which is an emblematic hairstyle for Black women across the world. At her reception, Nama donned a “Chitenge” gown, which was designed from a fabric common to African countries such as Zambia and Malawi. 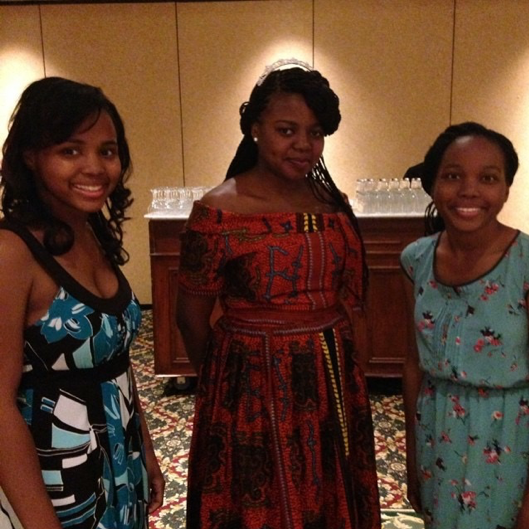 (From left) Me, Nama, and my sister at Nama’s reception. She is wearing the Chitenge dress, a traditional African gown. Five years later, Nama takes care of their sons, Samuel and Noah, and Ricky works in the U.S. Air Force. Nama and I get a chance to talk at length. She elaborates on the wedding and the ceremony and on her transition to living in the U.S.
“I wore my African dress,” she says, and she didn’t have a “traditional kitchen party,” which is what she calls a bridal shower. The conversation naturally turns to Livingstone, Nama’s hometown. 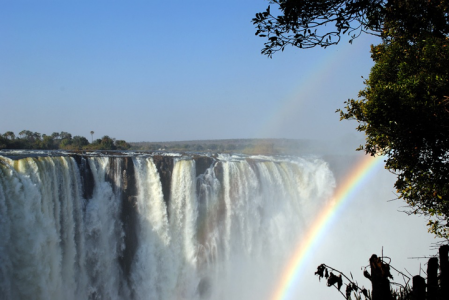 Nama gets achy and her eyes light up, talking about Victoria Falls, the waterfall in the Zambezi river between Zambia and Zimbabwe, that is often marked as one of the seven wonders of the world. She tells me more about her name. “Nama” is a nickname for Namakou, one of four names she now has. When comparing America and Zambia, Nama mentions nomenclature. In the U.S., we have a given name, a family name, and possibly a middle name, but Zambia’s nomenclature is different, Nama says. 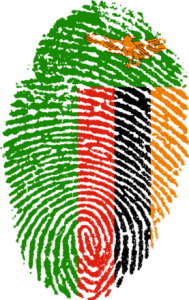 In Zambia, individuals can take four names: an English name, a traditional name, a family name, and a married name (for women). So, Nama’s full name is Royce (English name) Namakou (traditional name) Filoka (family name) Baker (married name). For the most part, Nama and Ricky have stayed true to her Zambian culture and customs. “Everything is the same,” she says.